Recently on Tumblr, I ran across a list of the six styles of love as defined by John Lee, and naturally my mind strayed to romance novels. Almost all of Mary Jo Putney’s Fallen Angels historicals fit here; Shattered Rainbows comes to mind for the very passionate, emotional attachment between Lord Michael Kenyon and Catherine Melbourne. The classic example is Edith Layton’s Traditional Regency The Duke’s Wager. Regina becomes the prize in a wager between the Marquis of Bessacarr and the legendary roue the Duke of Torquay. Ludus was alive and well in the Regency period, evidently — the trope of a female as prize in a wager is common in the Traditional Regency, though few have done it so well as Edith Layton. Like Mary Jo Putney and Eros, Carla Kelly writes almost exclusively to the Storge style of love, allowing her heroes and heroines to grow to love one another from a seed of friendship and mutual understanding. One of her finest examples of Storge is her Traditional Regency With This Ring. Lydia and Sam meet when she volunteers at a makeshift military hospital, and develop a close friendship that deepens to love. Pragma should have been easiest for me to identify; after all, romance is a genre that abounds with stories of marriages of convenience. But when I see Pragma assigned to a style of love, I think more of love that comes from an intellectual connection rather than an hormonal connection — not business so much as intellectual pleasure. One of the first romances I thought of as I brainstormed was Laura Kinsale’s historical My Sweet Folly, which begins with correspondence between the two leads, who are separated by continents and years. But the letters between Robert and Folie are too romantic, even at the outset, for this to apply to my somewhat narrow standards. Two other books, though, did come to mind. The first, My Dearest Enemy, an historical by Connie Brockway, also relies heavily on letters between adventurer Avery Thorne and suffragette Lily Bede. Unlike Robert and Folie, who find themselves romantic and kindred spirits from the start, Avery and Lily’s letters begin as intellectual sparring before growing into a deeper affection. The other book, Heart in Hiding by Emma Richmond, a Harlequin from 1990 that I recently reviewed, might be more of a Pragma story than even My Dearest Enemy. 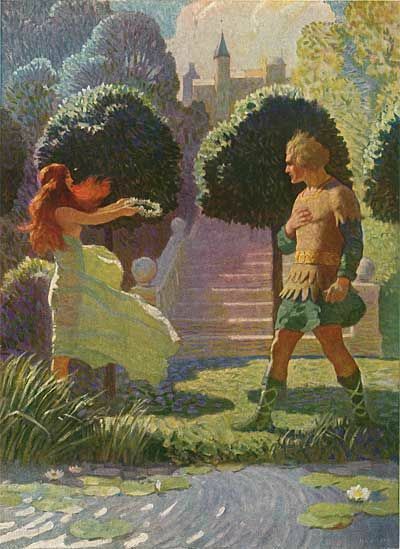 Corbin and Verity, the hero and heroine, seem barely aware of each other as man and woman at the book’s beginning; only as Verity proves herself resourceful and indispensable, and Corbin reveals himself as more than an irascible destroyer of all things electronic do they begin to develop romantic feelings for each other. Pretty much most Gothics published between 1960-1979, and 95% of the Harlequin/Mills & Boon output from 1970-2000. When linking Agape and romance, my mind went straight to another Laura Kinsale, the much-loved Flowers From the Storm, which is the story of Quaker Maddy Timms and Christian Langland, Duke of Jerveaux. Maddy helps to rehabilitate Christian after a devastating stroke leaves him confined to an asylum, in a seemingly textbook case of Agape. Instead, yet another Laura Kinsale book came immediately to mind, For My Lady’s Heart. A medieval historical, For My Lady’s Heart has as much in common with Chaucer and Arthurian legend as historical romance — Ruck, the hero, is on what can only be described as a spiritual quest to repay what he sees as a debt of the soul to heroine Melanthe that begins with a would-be saint’s pilgrimage. While selflessness, altruism and even spirituality are not necessarily the sole property of religion, few blatantly “inspirational” romances are as steeped in spirituality as For My Lady’s Heart. The influence of the church in the late Middle Ages is almost impossible for us as modern readers to comprehend, but Kinsale is one of few medieval romance writers who places the church in its rightful place in this period — it is the framework for the entire book. The church is what brings Ruck to Melanthe, and its teachings and commandments — commandments that carried the weight of law during the Middle Ages — drive much of the book’s plot and almost all of Ruck and Melanthe’s actions. The book’s sequel, Shadowheart is also the rare example of true Agape in romance, albeit to less effect than the epic For My Lady’s Heart, which is so steeped in the period that it uses Middle English for all dialogue. Shadowheart does, however, have one of the most affecting climaxes I have ever read in any book — one that hinges on Allegretto’s spiritual salvation. John Lee’s styles of love were conceived as a “psychology of love,” a way to identify the difference between the ways humans express love and explain why there is, sometimes, a very basic breakdown in relationships resulting from conflicting ways of expressing and feeling love. Using them as a basis for literary criticism may be disingenuous, but it’s a case of the shoe fitting, especially in the case of romance. Any well-written romance will show the hero and heroine cycling through several of the styles of love as their relationships progress, but most all romance novels seem to rely heavily on one style of love to define the relationship between the two leads. This defining style of love is synonymous with theme — i.e., bodice rippers falling squarely into the Eros style, inspirationals with a Storge theme, or those patently Pragma old-school Harlequins, full of boss/secretary and marriage-of-convenience romances. Using Lee’s styles of love as a classification system that transcends subgenre just calls to the librarian in me. The styles lend themselves so easily to this use, allowing for description of a book’s tone or theme. We all know, for instance, what the term “Gothic Romance” means, but further classification in terms of the love styles could help the picky reader to weed out the “Mania Gothic Romances.” It’s an imperfect classification system, yes, but an intriguing place to start. Categories: Critical Thinking, Random, Romance | Tags: Carla Kelly, classification, Connie Brockway, Edith Layton, Emma Richmond, Fallen Angels, Flowers From the Storm, For My Lady's Heart, genres, gothic romance, Harlequin/Mills & Boon, Heart In Hiding, John Lee, Laura Kinsale, Mary Jo Putney, My Dearest Enemy, My Sweet Folly, Shadowheart, Shattered Rainbows, six types of love, The Duke's Wager, thoughts on romance, With This Ring | Permalink. Categories: Browse on By, Literature | Tags: A Band of Bees, Air, Al Aronowitz, Barney Hoskyns, Carla Kelly, Cats, Chris Salewicz, Genre Fiction, George Clinton, Rock Journalism, Royksopp | Permalink.